The Targeted Agricultural Modernisation Schemes were launched in May 2015 to support the sustainable development of Irish agriculture. The grant- aid provided will enable farmers to meet the challenges of climate change and to increase efficiency on their holdings. TAMS schemes were launched under the new Rural Development Programme 2014-2020 and are co-funded under the European Agricultural Fund for Rural Development (EAFRD). The Low Emission Slurry Spreading Scheme (LESS) offers grant aid for efficient slurry spreading. The scheme is designed to encourage the purchase by farmers of specialised slurry spreaders. There are a number of machines available such as trailing shoe, dribble bars, shallow injection systems and umbilical slurry spreading systems. 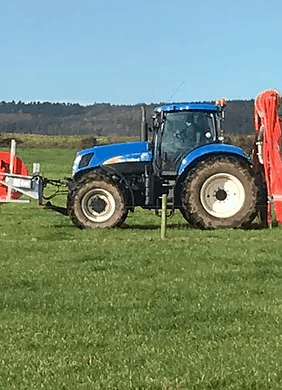 These spreaders are designed to minimise nutrient loss during the application of slurry which will help Ireland to achieve reductions in GHG emissions including reductions in nitrous oxide emissions, and ammonia emissions. TAMS offers a 40% grant subject to a maximum eligible investment of €40,000 or €60,000 in the case of a joint application by two eligible applicants or partners under a registered partnership. ​Derek Beirne a farmer and agricultural contractor from Elphin Co. Roscommon availed of TAMS funding to purchase a dribble bar. The dribble bar cost in the region of €16,000 and Derek expects to receive a 40% grant on the investment through the TAMS scheme. Derek covers a 20 mile radius of Elphin. “I expect to receive a 40% grant for the purchase of a dribble bar. The hoses of the dribble bar trail just above the ground placing slurry at the grass root, preventing nutrient loss. I have 200 clients in the area. 90% of dribble barring slurry spreading is for GLAS clients. With the GLAS scheme providing a payment of €1.20 m3/yr to farmers for low emission slurry spreading demand for LESS has increased dramatically since the opening of GLAS. All of the slurry produced or imported on the farm must be spread using LESS equipment. The benefits of LESS are more efficient use of nutrients by the crop, resulting in lower use of artificial fertiliser. Reduced run-off from the land leading to improved water quality and reduced odour from the slurry. “…without the funding received from TAMS I wouldn’t have been in a position to invest in a LESS Slurry Spreader. The financial incentive under the GLAS Scheme is creating the demand among farmers for the Low Emission Slurry Spreading”. Click here to download more information on the TAMS Scheme.